On November 30th, 2014, the Hinton Mountain Bike Association's president, Jan Vassbotn, will be stepping down from his post. Jan has given the club 4+ years as an executive member, with a number of those years as President. The current, and past executive, that have worked with Jan, want to give him a big THANK YOU for everything he has done to promote the HMBA, the Bike Park, and the sport of mountain biking in our region. In all honesty, it hasn't always been pretty and it hasn't always been fun, stress free work, but Jan poured heart and energy into making this club successful. Thank You, we appreciate everything you have done! Thanks for a great 2014 season! Our membership numbers were the highest we have ever had. Every weekend, we seemed to be meeting someone new at the Bike Park, so our amazing backyard is getting recognized as a great biking playground. Beaver Bike fest was a success and the 2 day August format may stick (we will be looking for consistency on the dates as well). Thank you to all current and past executive, members, volunteers, and sponsors, for making this club as great as it is. It really is a great thing to be a part of. Have a great winter and don't forget to contact us if you are interested in sitting on the board or helping with Beaver Bike Fest organizing! HMBA jerseys and socks - Awesome gift ideas! Are you looking for a great gift idea for that special someone ? Are you looking for a gift that looks awesome AND benefits a biking community? The Hinton Mountain Bike Association has rad jerseys and socks for sale - and they can be bought via our website! All proceeds from apparel sales goes back to HMBA and supports our various activities and events. Get your jerseys and socks here! Talisman Investing in our Community, again! 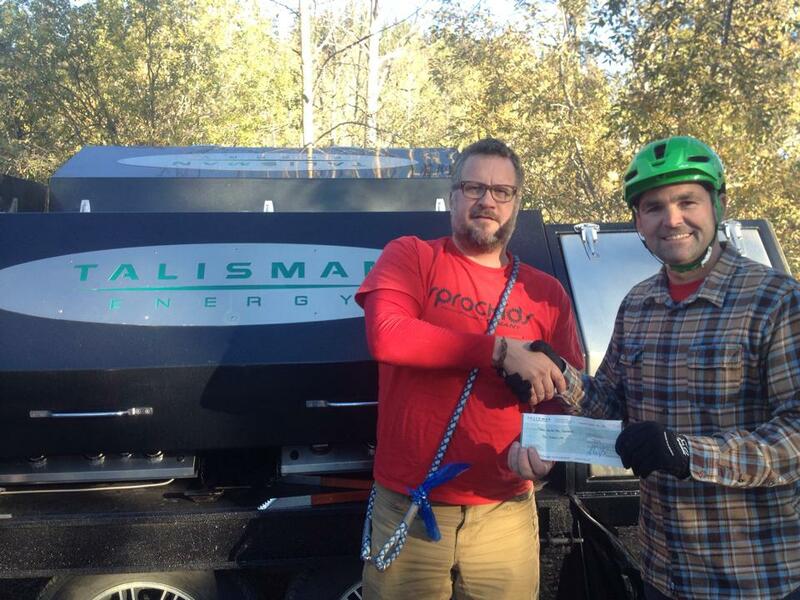 Much thanks to Cody Begon and Talisman for a generous donation of $500 to HMBA! Through its 'Investing in our Community' program, Talisman gave Cody $500 to donate to his choice of group or program and he once again chose HMBA! Thanks Cody! The cheque was presented to Jan Vassbotn, HMBA president, at the year-end BBQ for HMBA's Sprockids program at the Hinton Bike Park. HMBA has submitted a proposal for the 'Participatory Budget'. 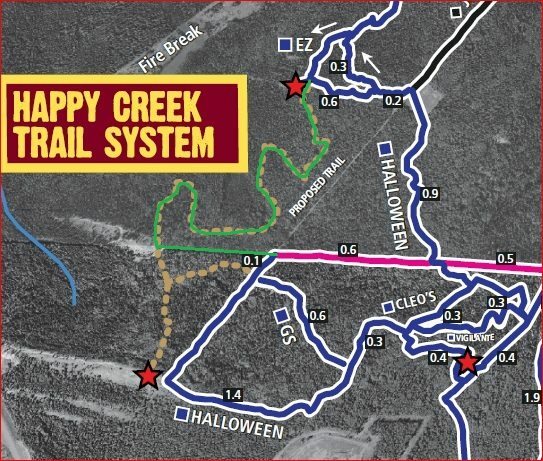 Hinton's amazing signature trail, Happy Creek, is going to need some major work done on all the bridges and wood features. We will keep you all in the loop with reminders to come down and vote when the time comes! This is not just a project that will benefit the mountain bikers, but it will benefit runners, walkers, hikers, and visitors who enjoy using this great trail! Participatory Budgeting is a democratic process where community members directly decide how to spend part of a public budget. It is taxpayers working with local government to make budget decisions that affect their lives. It is a different way to manage public money that engages people and government. Click HERE for more information on this process! Citizens of Hinton and Yellowhead County (west of Obed) over the age of 14 may vote on one of two days (a Wednesday and Saturday) by paper ballot. Only ONE vote per person! Update on the "GS Extension" trail. 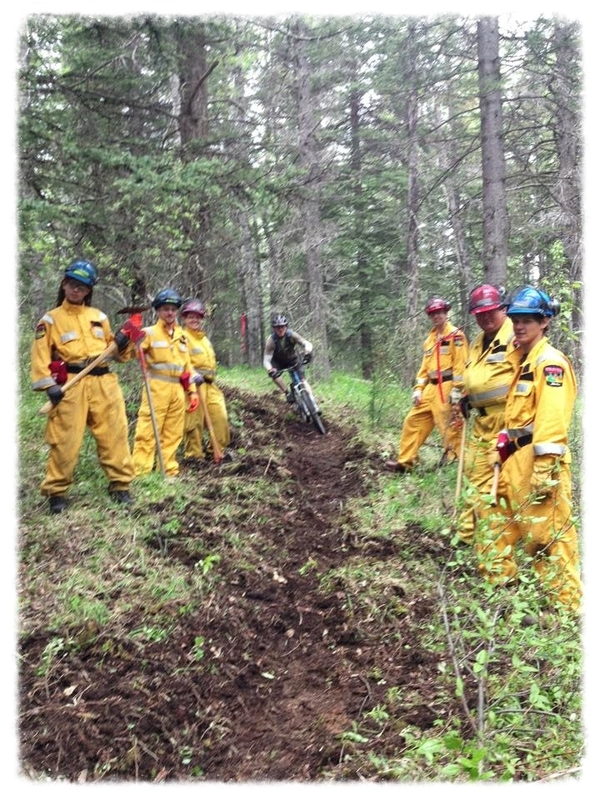 A small crew has been hard at work and the first section is rideable! Please watch for flags on corners and use caution as this is still in a early state until it gets more traffic. Refer to the 2014 HMBA map "proposed trail" and note the route in green below. Connect back from the cutline to GS, Halloween / Cleo's. Trail work will continue this week (snow pending?!?). Feel free to contact Kevin, hmba.trailsATgmail.com, if you would like to help. Thanks! The Hinton Mountain Bike Association would like to thank the following sponsors for their support in all of or in part with bikehinton.com website sponsorship, Bike Hinton Giveaway prizes, 2014 Trails Map, and promotion of Alberta's Mountain Bike Mecca!